Pleased to redpoint Aitzol 8c. Definitely my first 8c warm-up! After a long drive from Magic Wood we arrived in Catalunya feeling a bit tired. 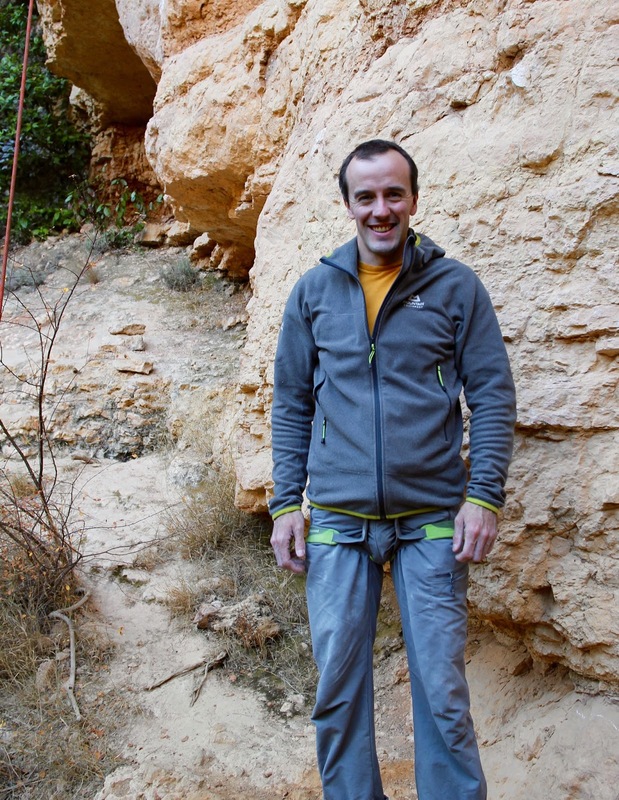 I had a bit of realisation that going from pulling on for a couple of seconds on a Font 8C to trying to do stamina routes in Margalef was maybe not going to be easy, especially as I still couldn’t pull on pockets properly after straining a lumbrical in Magic Wood. My goal for the week was not too ambitious. All I wanted to get was revenge on Aitzol (soft 8c). In late 2013 I was here for a week with Alicia. We’d had the trip booked for ages and in the interim period I needed to get my second ankle surgery and the date for that fell just over two weeks before the trip. Not ideal. I said I would still go and just do what I could - probably just belay and feel sorry for myself. I arrived in Margalef still barely able to walk 100 yards and still taking antibiotics for a painful wound infection. On the first day I was almost in tears just walking from the car 100 metres to buy the guidebook. I limped up a 200m approach and just belayed Alicia and popped painkillers. After that the tide turned on that particular recovery. And quickly. The next day I did one 6c. The next a 7a+. The next an 8a redpoint. Then on the final day I got 7c+ onsight, 8a+ redpoint and almost managed to redpoint Aitzol 8c. I fell just after the crux but couldn’t really make the most of the heel hook rest and couldn’t do any drop knees. It was fantastic to leap back trough the grades day after day and switch from delicate surgical patient to rock climber again. I knew that my next time in Margalef I would be straight back to try and finish Aitzol. I had a couple of tries in awful conditions and although the moves were no problem, I was getting pumped after ten seconds on the rock. But after a rest day the rock was drier and I returned and started up it straight away, opting to just work the moves a bit for my warm-up. I arrived at the heel hook rest feeling quite good, so decided to continue. Next thing I was through the crux. I was definitely feeling quite warmed up by then. I climbed all the way to the anchor without really getting that pumped. At the start of the trip I bought a silly Santa hat in Barcelona in prep for Christmas family silliness. We a pact that if I fell off a 6c or failed to get overlapping halves on Aitzol, or if Alicia said ‘take’ on lead, we’d have to wear the Santa hat for the next three routes. After my 8c ‘warm-up’ I was chuffed when Alicia announced that I’d earned full immunity from the Santa hat for the rest of the trip. With my project done in the first ten minutes of the session, we headed off for a brew and then got on Llamps i Trons (8c+/9a post hold break). I certainly wont be climbing that in our last couple of days here. But I think I have a new project to return to Margalef for. 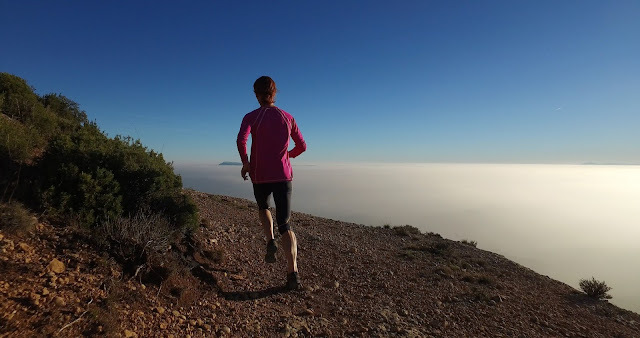 A lovely day filming Alicia with the drone on her favourite run in Serra de Montsant. Alicia enjoying the last morning in Magic Wood before the monster drive to Catalunya. Sunday boarding from Dave MacLeod on Vimeo. 1. To get ridiculously strong. 2. To coach other climbers there, in a nice environment with everything I’d want to be able to give good coaching. I was too busy writing Make or Break last year to start offering coaching again, and this year has been rather taken up with recovering from surgery and then going on climbing trips to make up for the lost time. But finally I’m excited to say I have my first MacLeod wall climbing coaching sessions arranged. I’ll be running them over three days of the Fort William Mountain Festival in February 2016. I’ll run two days of sessions on rock climbing technique and one day focused on dry tooling/winter climbing technique. The content is aimed at any climbing ability level and there will be up to 6 climbers in each session so you can come with friends and partners as folk often do. In the video and pics you can get a taste of the wall. Afterwards I hope you’ll join me at the excellent Fort William Mountain Festival for speakers and films which are always totally inspiring. All the workshop (and festival) details are on the festival site here. Best book a place soon, they do tend to sell out. A couple of years ago Natalie Berry asked if I’d be keen to show her some trad climbing places around Scotland as she was making a move from competition climbing into trying out trad and general mountain adventures. Of course I was delighted to climb with her and along the way, the Hot Aches crew of Paul Diffley and Chris Prescott followed her progress and the fun times we had. The trailer above is for the film which is now finished and premiering at the Kendal festival shortly. We’ll see you there if you are coming. The process nearly fell at the first hurdle thanks to my ineptitude at catching a tiny crimp properly on Hold Fast Hold True (E9) in Glen Nevis. It was the very first day Nat and I climbed together. Nat did her first trad lead and then we climbed another few pitches before I decided to go for Hold True. I was actually climbing it really well and was almost distracted by the fact that I’d just dispatched the crux totally static. Then I just caught a crimp one finger-width to the right of where I should. A tiny error. My left ankle was already in a sub-optimal state after a fall 15 odd years before. Landing on it again from a great height didn’t help it much at all. I was seriously not happy with myself for making an error at one of the worst possible moments, not least because of how the experience of watching someone fall earthward might affect Natalie. It’s not really in the ‘mentor’ job description. However, she still wanted to climb with me (once I’d had surgery) and so we went on to have quite a few nice trips to some amazing corners of our islands. We did quite a few mega classics, got freezing cold on ice routes, got too warm on melting ice routes, took falls, went for long runouts, opened new routes and stood on top of the Ben on a perfect day after a fine ice climb. It kind of led up to Natalie’s ascent of Dalriada on the Cobbler just a few weeks ago, a fantastic effort in very cold late season conditions. The film is great because you don’t normally get to see someone as they progress right through from fumbling wires on a hard severe, to calmly running it out on mountain E7 in the mist, while shivering away from the cold. It was a pleasure to watch Nat’s progress unfold. It’s always a pleasure to watch great climbers progress - when they have talent and a determination to see through what they started, you know they will get there in the end. Watching the film back also made me want to have more trips like those, if Nat will tie on the the rope with me again. I promise I wont fall off and hit the deck, and will leave the crag before it’s totally dark! If you are at Kendal, I'm speaking there at 10am on Sat 21st. Transition is premiering at 7.30pm on Friday 20th. All the details are on the Kendal site here. Magic night in the Wood from Dave MacLeod on Vimeo. The last two weeks have been my third time in Magic Wood in Switzerland. The place is packed with some of the hardest and most iconic boulder problems in the world and for that reason it’s a great testing ground of your level in bouldering. It’s still a long term ambition of mine to climb a Font 8C, but fit this into my normal all-round climbing life of trad new routing, winter climbing etc. I’ve always admired the Chris Sharma creation ‘Practice of the Wild’ and have this as a lifetime climbing goal. It’s a little tough as a goal, not just because it is 8C but also because sometimes one particular boulder problem that’s above your current limit might not match your strengths. However, it’s not just about the grade - I’d just love to one day climb that line. 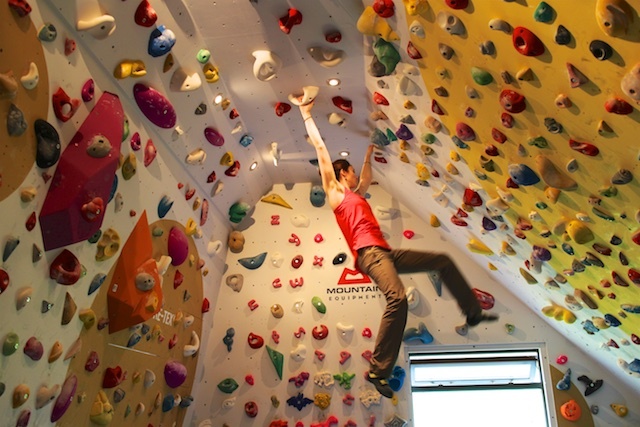 For to happen I know I’d need to be doing a lot more bouldering than I do now. Coming from a summer of big wall climbing and a bit of trad, I felt totally weak on it when I arrived two weeks ago. Just nowhere near even doing the moves. So I tried some other projects. First I went into the Darkness Cave and spent a couple of sessions on Dark Sakai 8B. I almost got it about 5 times and felt quite confident that I might manage it after a rest day. Unfortunately I woke the next morning to realised quite badly tweaked my finger (strained lumbrical) on the nasty pocket at the start. I went back to it but immediately realised I’d have to leave it for this trip - my finger was not happy. I sat out some wet days and then started from scratch on another dream line I’ve been wanting to do for a few years - One summer in Paradise (8B). I worked out the moves over a couple of quick sessions when it was still really damp. Although I could do the moves, I wasn’t feeling very confident about my power level. 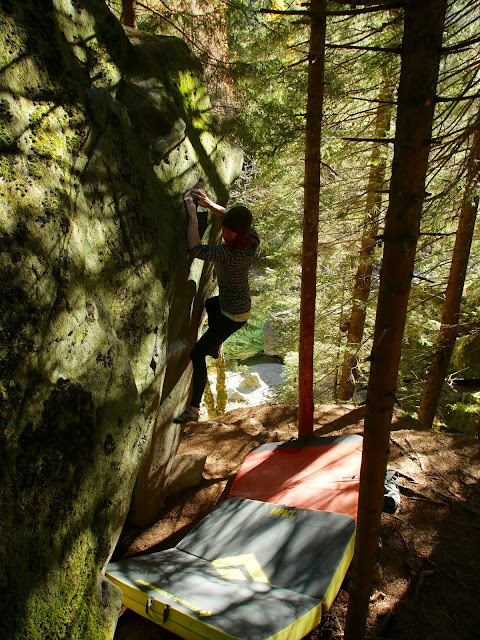 Yet on the third session and around two weeks into my trip, I finally started to feel some strength returning to my fingers and after a warm-up in the encroaching darkness, I climbed it pretty easily first try. I was absolutely delighted to feel like I was moving well on the rock and feeling like I could actually do something. I was expecting to be trying the line all evening so I headed down to the famous Riverbed 8B which I’d played on a little previously. I was enjoying just working out the moves in a kind of relaxed fashion and started thinking I would probably return to it. But when I started from the start I found myself climbing the whole thing. As I climbed through the crux I realised I better really concentrate and try and do it, but relax at the same time. There were some exciting moments as I hadn’t placed my torch to shine on the upper headwall and ended up groping around in the dark trying to find the finishing jugs. Brilliant! I was over the moon to climb two dream 8Bs in a night. Like so many climbers I watched Dave Graham doing the first ascent of Riverbed in the Dosage films and was inspired to visit Switzerland for bouldering. I had one session left and decided to return to Practice of the Wild. It was still really damp (it’s in a deep cave and seems rarely totally dry) and on warming up I almost just left it because the holds were quite slippery. But curiosity basically drove me to keep trying and after an hour I finally managed to do all the moves. I couldn’t do any more than that, but I was ecstatic. For me that feels like a real breakthrough and a tentative thumbs up for some changes in my training picture recently. It’s definitely put some extra fire into my motivation to train specifically for bouldering and return to Magic Wood with the confidence that this climb is actually a possibility for me. For now we are off to Spain for a week or so to go back to the sport climbing. Hopefully at least I will be able to pull on the holds, although no doubt I will be pumped by the third bolt.